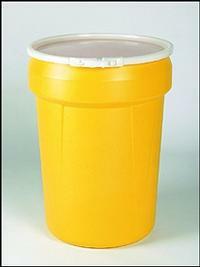 Ideal for the storage, transportation, clean up and spill containment of small containers (5 gallons or less). Constructed of 100% blow-molded high density polyethylene with UV inhibitors for superior strength and chemical resistance. These lightweight drums are nestable and incinerate completely. Drums meet UN Rating HM-181 1H2/X100/S, performance requirements of DOT 49 CFR 173.12(b), and can be used with packing groups I, II, & III of hazardous materials.